This is my favorite time of the month right now. I love seeing how everyone is doing, and recording my own progress, even though that’s slower than I wish it were. That looks pretty good, doesn’t it? All that green! I like seeing my net worth over $6000, too. It’s climbed by $25,000 in fourteen months. If I can keep that pace up, that would be good. Yeah, that would be because I over-spent my income in August. I don’t really regret any of it, even the $50 I spent eating out in Chicago, but I desperately need to have a better September (and October, November, and December) so I can knock out that debt and build up a slush fund to draw on for more expensive months. I’ve got to get to work, so this is a short update, but I was thinking as I looked at mint.com this morning (just to admire the deposited paycheck, you know) that it feels good to have decided that I’m in charge of where I’m going in life, financially. Strictly speaking it’s not true; in a lot of ways I really do have to “wait for someone to give me a job.” I can’t make them appear out of thin air. But this was a year in which I actively solicited more income for myself through side hustles and also, and this is the key, made a plan for what I’d do with the money. I’ve always worked a little on the side: babysitting, the occasional freelance editing, whatever — but I’ve also always just routed it into groceries or whatever without really thinking about it. But now I’m thinking more long-term about where I’d like to be, financially, in 30 years, and really trying to assign incoming money to places that will help me get there. It’s a cool feeling, to be responding to immediate needs and inputs a little less reactively, a little more proactively. 1) Art Institute membership: $70. Well worth it since I’ve already used it twice and only need to use it once more this year to make it pay off, but an expensive up-front cost. 2) Eating out: $50. This was all in Chicago over the course of a single two-day trip. 3) A new phone: $180. I bought this so I could get on a family plan with some friends and lower my regular monthly outlay. Three days after I bought it…my old phone finally died of old age. So I guess I would have had to spend this almost no matter what. I think it was a decent purchase, it just is a lot of money at once. 4) Personal care stuff: $170. I laid in supplies for several months’ worth of a few things I use a lot, but again, this is a lot of money all at once. 5) Car registration stuff: $96, as previously noted. 6) Books for a class I just decided to audit: $150. God bless the used market on amazon, since this is probably about half what they would have cost if I’d bought them all new. I may be able to sell some of them at the end of the semester, if I don’t end up deciding to keep them all. Still, say it with me: a lot of money all at once. Oy. The Art Institute, the eating out, the personal care, and the car registration all came out of the month’s “slush” money, but the phone and the books — that is, $330 of stuff! — were decisions I made after that nice post about how if I just kept my groceries and gas down, I could get out of the month on budget. So much for that. It’s part of why I was feeling so grey yesterday, the sense that I’m already behind for September and the month hasn’t even started yet. I decided to do three little things that don’t really change the financial situation (playing the shell game again), but I think will make me feel better. 1) I had $107 sitting in my Roth IRA holding account. I’ve been leaving this til I rack up $250 but the side hustle business was really slow in August, so I just bought $100 of shares. It’ll put my investment accounts over $5500 by the end of the month; otherwise they would have stopped just shy of that. 2) My emergency fund was up to $575 after I put September’s contributions in. I just took the $75 and applied it to my credit card. I am NOT going to do this again, unless there’s a valid emergency (school books and broken phones don’t count), but that random $75 was a leftover from my old system of having the world’s tiniest emergency fund and it feels more like tying off a loose end. 3) I have $30 coming in from side hustles this week, and I’m going to apply that to the CC too instead of my retirement fund. Again, I want this to be a one-time action; my “all extra income to the Roth” thing has been working out well and I don’t want to mess with it too much. All right, I do feel marginally better. Just accounting tricks, no impact on my net worth, but still. …of angst. This is sort of my equivalent of posting while drunk, I guess 🙂 I’m mostly just tired today — didn’t sleep til late last night, still had to get up at 7 am, have been stumbling around most of the day — but the money thing just feels like a wall I’ll never get over right now instead of like an interesting challenge that I’m getting through ok. The problem is that my disposable income and my wants reallllly do not match up right now, and some of those wants are shading over into needs. Good moisturizer (drugstore stuff makes me break out); summer sandals (my current pair is three years old and has holes in the soles, but I’m going to drag them out for another month); shorts (both pairs also three years old); work dresses/skirts (what I have is a) not enough to cover all the days I need to dress nicely and b) mostly aging and pilled/stretched/otherwise beginning to look not so nice); sneakers (about three years old, also developing holes); a big canning pot that would fit quart jars; angst-free plane tickets to see a friend over spring break. I was so focused on retiring the student debt the last few months I had it, and I enjoyed killing it in huge chunks — $1000, gone! $2000, gone! $2500, GONE! The remaining CC debt is so small by comparison, and yet it’s feeling almost insurmountable. It’s harder than I thought it would be, mentally, to not address it at full intensity; I decided that it was a small enough amount that I could pay it off a few hundred dollars at a time while also saving for an EF and travel AND having enough left over for the random bills that come up, like the car stuff I had to do this month and the CSA share I have to pay for next month. But it’s surprisingly a big downer to look at how the balance of the CC isn’t dropping that fast even though the net worth is improving. OK, I’m kind of enjoying finagling my way through this last bit of August. I’d enjoy being rich and carefree a little more, probably, but I’m proud of myself. To make up for the $23 difference between the slush fund and the car stuff, I first “found” $3 by drawing it from my car insurance category for this month and next month (when I budget, I round up because it’s easier than remembering the exact number, which is $53.30.) Then I just had to see if I could buy all my food for the week using $15 plus $2 in loose change I scared up. I looked around at my pantry again and thought about what I wanted to make. I had a few ingredients in place already (frozen homemade black beans, soba noodles, miso) so I settled on Black Bean and Tomato Quinoa and Cold Noodles With Miso, Lime, and Ginger. Then I took my last two quarters and bought two little butter cookies from the Polish bakery stand. And I came home with a $20 bill still in my wallet. Not pictured: the ginger, because I forgot to put it in the picture, and the two cookies, because I ate them. But I did have some good minor wins this week in my nemesis category, “food.” First of all, I raided my spare change jar to help pay for a dry cleaning pickup, so I have $31 to spend this weekend on groceries instead of the $27 I thought I did 🙂 Second, even though I had a friend come unexpectedly for dinner last night, I did not freak out and spend lots on groceries. Luckily, I had a lot in my pantry that I could use to assemble a very cheap, but pretty elegant dinner. So I bought mushrooms ($1 for 8 oz, on sale, woo) and a shallot ($.50). I fried those up, then made polenta from the cornmeal, salt, and butter, then assembled the dish: polenta, drizzle of balsamic, mushrooms and shallot, a bit of feta crumbled on, then a fried egg on top of the whole thing for each of us. And a glass of wine. Then we went over to someone else’s house for dessert. And while I was at the grocery store getting the mushrooms and shallot, I did NOT give into the urge to buy ice cream, which is a win on many levels. 9 percent of six months of…wait, what? *3 checking accounts. One is my “main” one, one is the Santander one I’m using for direct deposit so I can make $20 a month from them (!still not over that), and one is the capitalone360 account that I used to use as my “ATM” account and now basically use as a container to hold money once a month. Why, you ask? Because in order to remain no-fee, I still need to have $500 direct-deposited into my main account. But my paychecks are now going to the $20-a-month one. The hack for this — I know, I know — is to transfer my first paycheck to capitalone, then “push” the money to my main checking account, where it apparently looks to them as if it were a direct deposit. This is eye-rollingly complicated, but it’s working, and, again, it’s making me $20 a month at the cost of about 5 minutes of pressing buttons, so I’m going to keep on with it. *Then I also have a Santander savings account and three capitalone360 savings accounts: emergency fund, travel fund, and the account where I hold onto the extra money I’m accumulating for my Roth IRA. Every time that one reaches $250 I buy more Roth shares, and in the meantime it earns a tiny bit of interest. So that would be seven bank accounts. Nutty. And most transactions take time to clear, so on any given day, I feel like what’s showing up in mint.com is inaccurate; it’s always missing pending charges on a credit card, or temporarily “losing” money while it’s between banks, or whatever. Because it’s just me handling all this, I’m usually aware of what’s “wrong” with the dashboard display, but wow. Anyway, my first “September” paycheck just cleared its way through the system, so I moved September’s e-fund contribution into that account right away because it might as well start earning interest now instead of sitting in checking until September 1. This puts me at 9% of my $6000 goal. Why $6000, you ask? Because that represents about six months of real emergency, bare-bones expenses. That’s a job-loss scenario in which I move in with my parents and pay no rent, but do continue to pay for my car costs, food, health insurance of some kind I guess, and other incidentals. So $6000 might actually get me through more than six months, but it seems like a reasonable start. Somewhat ironically, the most likely time for me to be out of work is actually next summer, by which time I won’t have that amount saved up; if I make it through next summer employed, I’m likely past the danger point, career-wise. But whatever, I can only do what I can do. Do your e-funds assume “bare bones” or “normal” expenses? It’s been a busy week, hence the blog silence. I did get paid (woo! favorite two days of the month) but I’ve also determined that my two big downfalls are travel and food. NEWS FLASH. Everyone’s two big downfalls are travel and food! Anyway, right now I am, just barely, on track to make my budget for August, but I just had an expensive out of town weekend and making my goal is going to require several things going really right in the next two weeks. 3) I need to have a very cheap grocery run next weekend. So, there’s some “wing and a prayer” stuff in there, but hopefully…. What did I do that was so expensive in Chicago? Well, it wasn’t really that expensive. I spent $30 on transit to/from the city (train) and $15 on a transit card that I’ll still have the next time I go (I only needed two rides on the El.) Then $25 on dinner (Ethiopian and delicious) and $30 on two picnic lunches and one picnic dinner. And $70 on a year-long membership to the Art Institute. I realized that if I even went three times during the year, the math would work out (a one-day pass is $23!!!!) and in fact, over the weekend I went twice, so now I only have to go one more time in the next year. I think I can manage that. So, none of this was uber-extravagant. But it added up. Then I came home and went grocery shopping and bought…cheese. Oh, cheese. If someone could show me how to abstain from cheese forever…. I was out of honey, too, so I had to buy a whole thing of that and it’s expensive. Anyway, I had a $42 grocery bill (this should get me through the whole week, and in the case of the honey through at least three months) which I paid in cash. But I now have $27 in cash which is supposed to get me through another week’s grocery trip plus any small random stuff (postage, coffee) that comes up. Plus I have $74 in “slush” to use on the car stuff. Ooof, it feels tight for two more weeks of August! I guess on the plus side, I really have been ratcheting back the grocery shopping, overall. There have been a number of occasions in the last month where I’ve not bought something that, if I weren’t watching my money, I definitely would have. Last week’s groceries were under $30! Doing this is genuinely cutting down on the number of random extras I throw in the cart. Today I only bought one thing (that cheese) that wasn’t on the list; I wish I knew for sure, but I’d bet that I usually average more like 5 unplanned purchases. 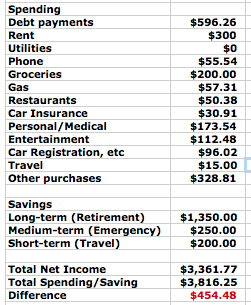 I’m not really sure how much good this will do me, as every month is different, but now that I finally know how much income I’ll have every month, I figured it was worth doing some generalized thinking about how I should be dealing with it. After taxes, health insurance, and $1000 a month deducted directly into my 401(k), my take-home pay per month will be (drum roll) $2147 and change. Fixed Costs — the things that aren’t really adjustable. Everything Else–that leaves $1387 to allocate. This budget assumes I’m saving 31% of my gross pay (I’m only counting the retirement and e-fund there) which isn’t an awesome rate, but also isn’t as bad as it could be. Once I’m out of debt, I’ll have another $450 a month to play with, and while I could theoretically save the whole thing, what I’ll probably actually do is put half of that, $225, into a housing/car fund, and put the other half into slush. Slush is covering a lot here — gifts, clothing, minor car repairs, professional fees I can’t get reimbursed for, whatever. I’d like to feel less pinched in what I spend on things like that, even if it means I take longer to meet other goals. Not, more or less, my mood, but definitely my IRA. It’s done nothing but slide for a week, wiping out many of the gains it had made. And I feel…ok about it! I mean, not as great as I’ve felt when it’s gone up $30 in a day (remember, my account is really small) but ok. I have reasonable confidence that over the course of the next 30 years, things will sort themselves out and I won’t end up actually losing money, even if I don’t make 25% back or whatever. This seems like a good thing. No panic! In other news, I’m kicking around August goals. August is a short month for me because I’m taking several weekend trips; I’m setting a goal of $350 in side hustle income (last month I did $485, just $15 shy of my $500 goal) of which I’ve already made $70, as of twenty minutes ago. Hopefully it turns out to be doable even with the travel. It would sure help if I sold one or two of the books I have listed on amazon right now…. Anyway, I’m wondering if I should apply that side hustle money to my credit card debt instead of my IRA. I think I shouldn’t — I think I should stick to the plan of putting the side hustle money where I can’t randomly spend it — but it’s tempting. I’d be out of debt a month or two earlier than I otherwise would be and it would free up so much cash flow from my real-job income. I’m reminding myself, though, that I shouldn’t steal from the future just to fund my somewhat irresponsible recent past 🙂 Also, that last $2100 of CC debt is on a 0% card, so it’s not costing me anything in interest to go the slow and steady route. I feel itchy about it though!